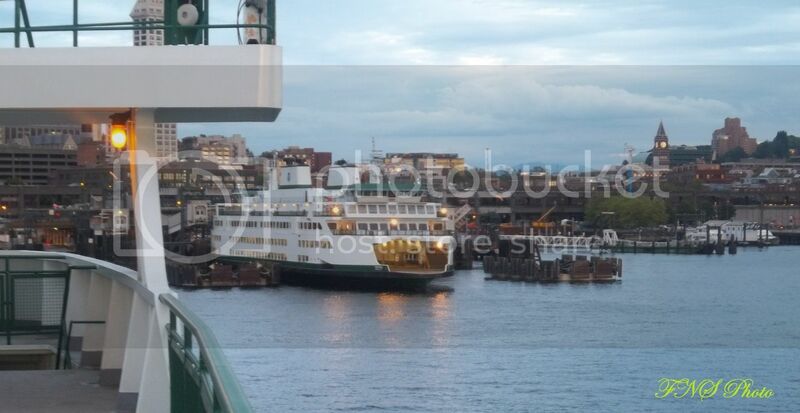 Up close and personal with Tokitae at Colman dock this morning, from a coworker during her commute this morning. I normally do not photograph the ferries on days like yesterday morning, as the flat gray, semi-mist weather often lends itself to flat, kinda of boring photos...however, crossing from Edmonds to Kingston yesterday morning on the 8:50, the Tokitae was on her way north. It was good testing for the new camera. Figured. That didn't seem like enough crew familiarization. If I recall she has been doing sea trials for just under a month? Actually two and a half. 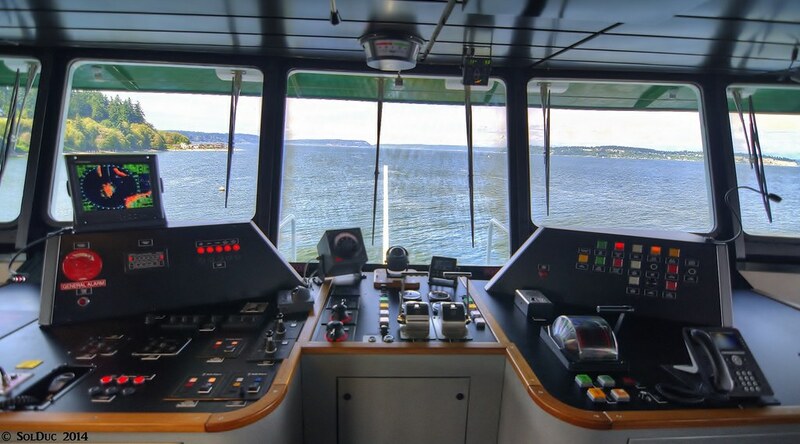 The engine crew was on during most (if not all) the sea trials that were done by Vigor, so I guess it's more dock and deckhand crew familiarization. I may be riding with Guy up there to the dedication ceremony / pilothouse tour etc. after I catch the bus out of Seattle, but I would likely need a ride back to Shelton. I can reimburse on fuel costs via PayPal as soon as my next eBay transaction deposits. I normally wouldn't make such a request however I ran into a duo of car repair issues on the way back from E. Washington that set me back on my available cash reserves. 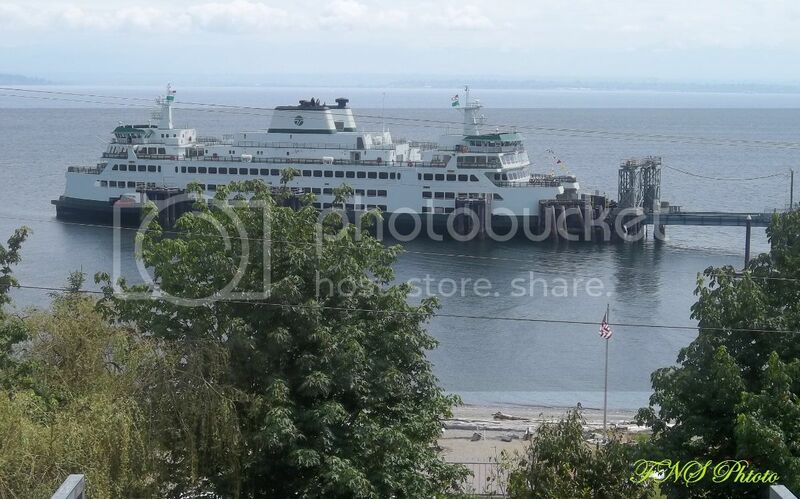 My wife was arriving at Clinton while the Tokitae was docked in slip #2 last week. She stopped, and hurriedly took this photo before it pulled out. I live in Clinton, and will be at the ceremony tomorrow. I'll get some pictures up soon. Tokitae is a fine ship...though the interior was a little disappointing. Take a mix of the JMII, and add the Hyak color scheme... They weren't officially doing engine room tours, but a few of us were able to go down courtesy of the engine crew. 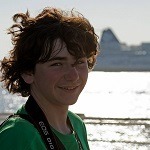 Also some kids did hit the ships whistle a few times when I was there. Definitely the same tones of the JMII. Thanks for the pictures. I made a brief appearance for the last half hour of the open house. I am in agreement regarding the interior ... its was very underwhelming. 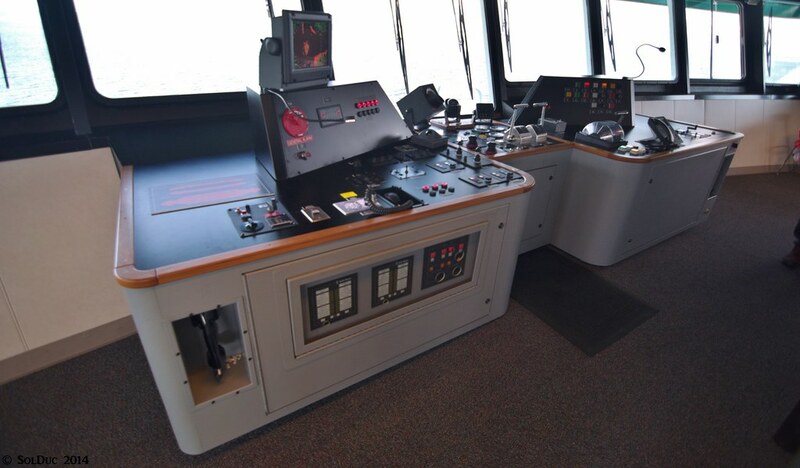 The refurbished Issaquahs and Supers will continue to have the best looking interiors in the fleet. 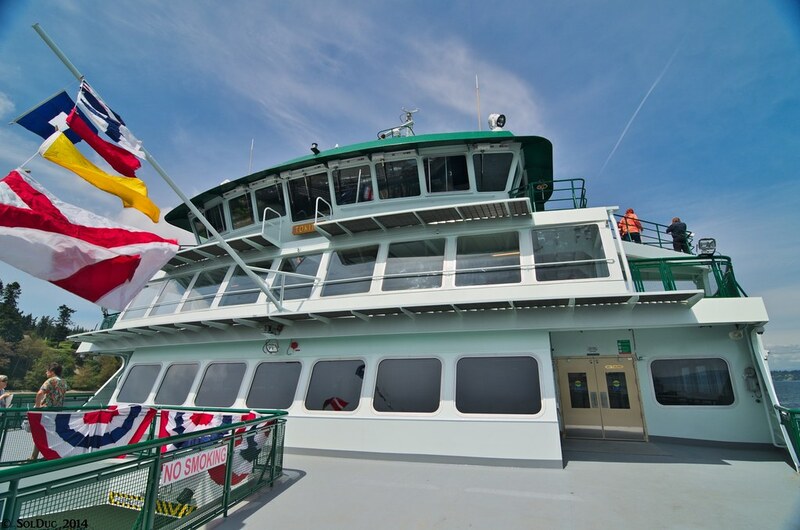 *The interior space on the main cabin did not seem substantially larger than that on an Issaquah class. A bit bigger, yes, though this is mostly because the shelter decks on each end are not present. 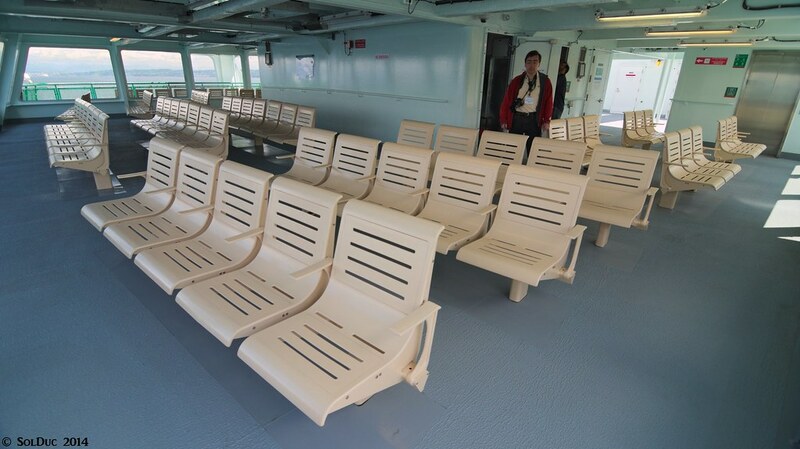 For those looking for an upgrade from packed interiors on the Issaquah class (at Bremerton and other walk-on heavy locations), I don't feel these will be a lot better. In the summer, sure, because of the upper deck. But on a cold, wet day in January, no way. The main cabin certainly has less seating than a Super class. 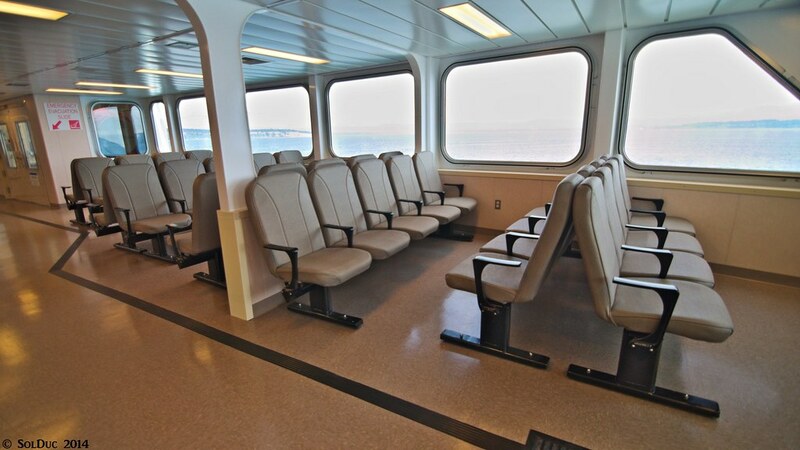 *The upper deck is very nice, with a lot of room in the shelter decks on each end. 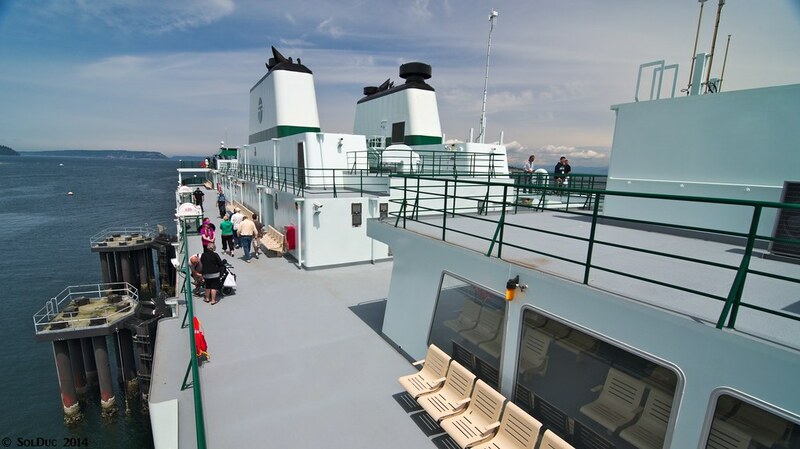 However, the shelter decks do not span the entire bow, and while it will be nice to stand on the corners of the upper deck and look straight ahead, without windows in place the sides will be very windy. 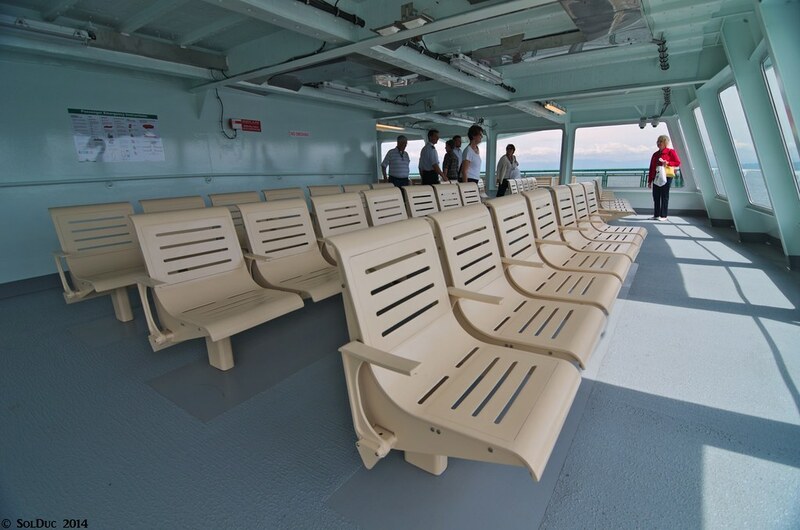 The superclass upper shelter deck stretches the entire beam of the ferry, creating a wind break up top. 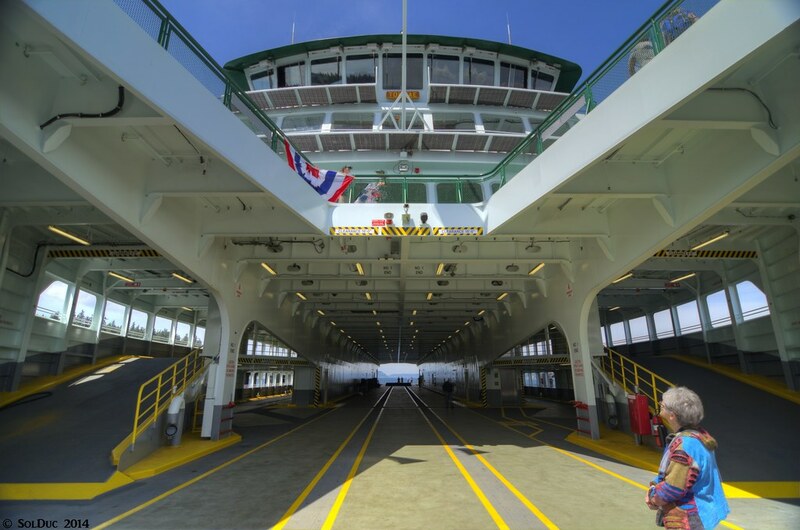 *Car deck is certainly wider than on a Super class, but it didn't feel substantively different than an Issaquah (maybe a little more room below the gallery decks). 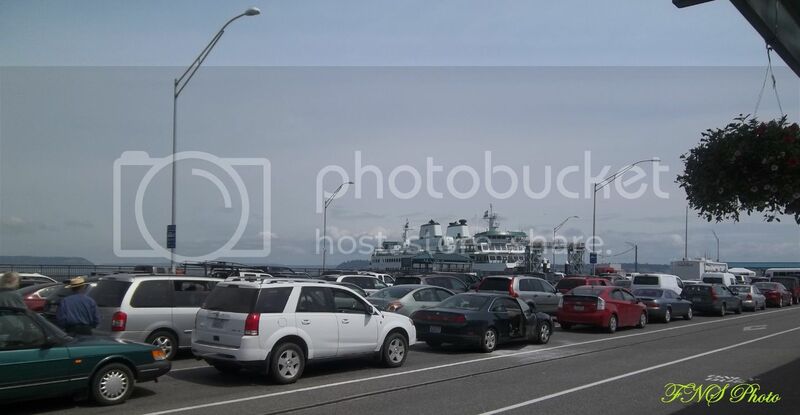 I remain unconvinced that they will be able to take more cars than currently when operating Mukilteo-Clinton. - Brown! Everywhere. However it uses the same base materials as the Issaquah class boats and others so it should wear better than the original Issaquah interiors but it is very "government". Someone else must've been making the decisions when the Supers/Issaquahs were done. 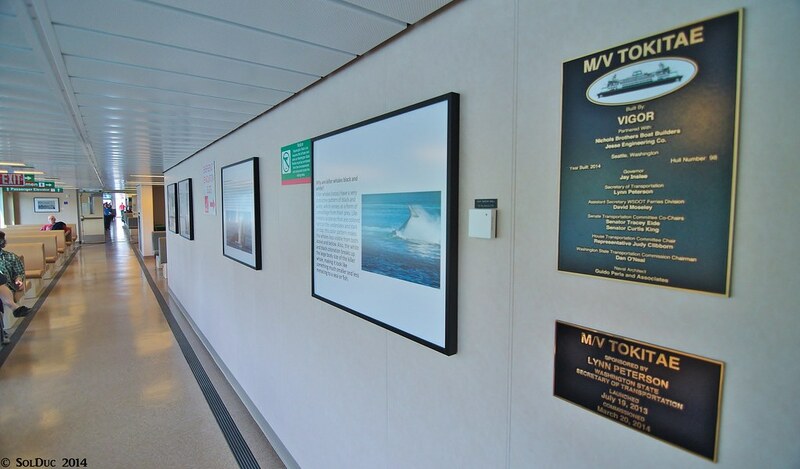 - The cabin is much bigger, but it is also much more "broken up" than the other boats by the two sundeck stairs, some walls and the MES slides which costs space and seats. But the square footage is there. One nice thing is those breaks should keep noise down. 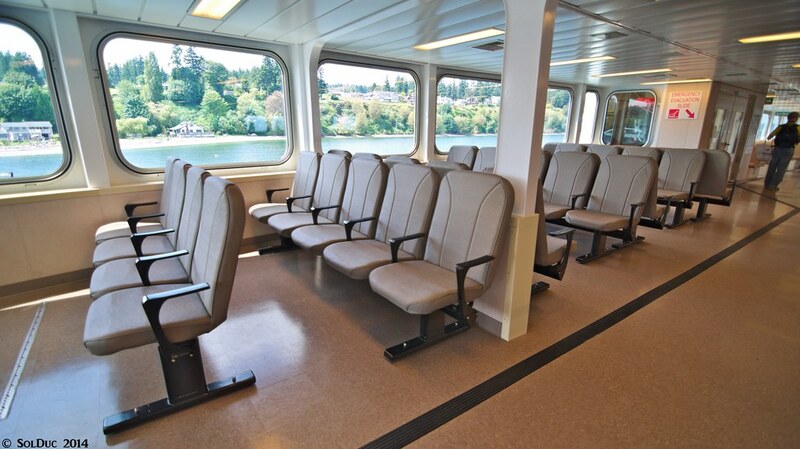 One of the big complaints I heard from coworkers that ride on Bremerton is the inability to find a quiet place to read/nap on an Issaquah, even with a light passenger load. This boat has a few nooks and crannies in the main cabin that should be more friendly to that. (One space I spotted was the first few seats forward of the MES slide housing). I think this more segmented approach is what WSF describes as "flexible seating". - The center tunnel is wider, especially the two outside lanes (at least as marked) but I don't think much width was added to the wings over the Issaquah's. The bulk of the extra 5ft appears to have gone to the ADA compliant stairs/elevators etc which makes sense. 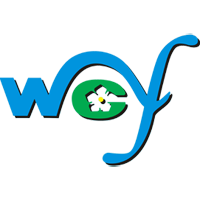 - WSF continues to use fluorescent lighting, was hoping to see LED. - I'm going to be really sad to not have sundeck access. 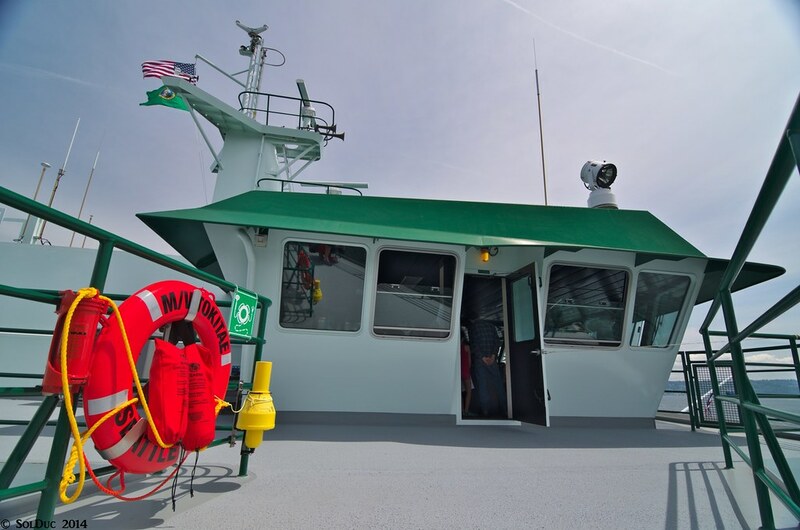 The cabin is much bigger, but it is also much more "broken up" than the other boats by the two sundeck stairs, some walls and the MES slides which costs space and seats. But the square footage is there. One nice thing is those breaks should keep noise down. 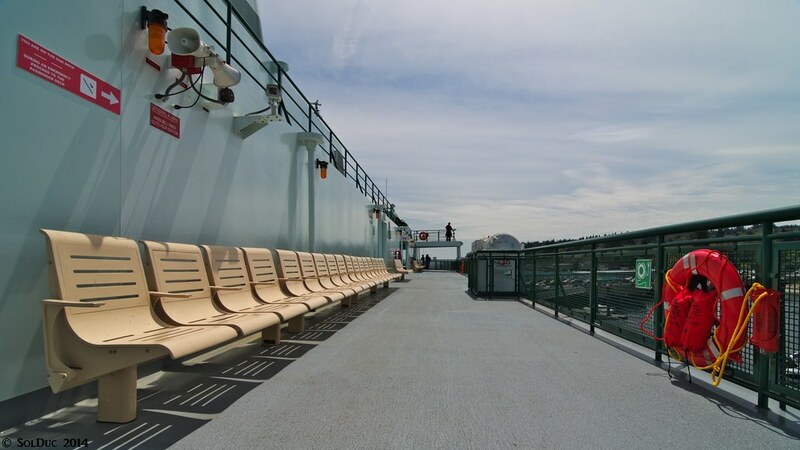 One of the big complaints I heard from coworkers that ride on Bremerton is the inability to find a quiet place to read/nap on an Issaquah, even with a light passenger load. This boat has a few nooks and crannies in the main cabin that should be more friendly to that. (One space I spotted was the first few seats forward of the MES slide housing). I think this more segmented approach is what WSF describes as "flexible seating". 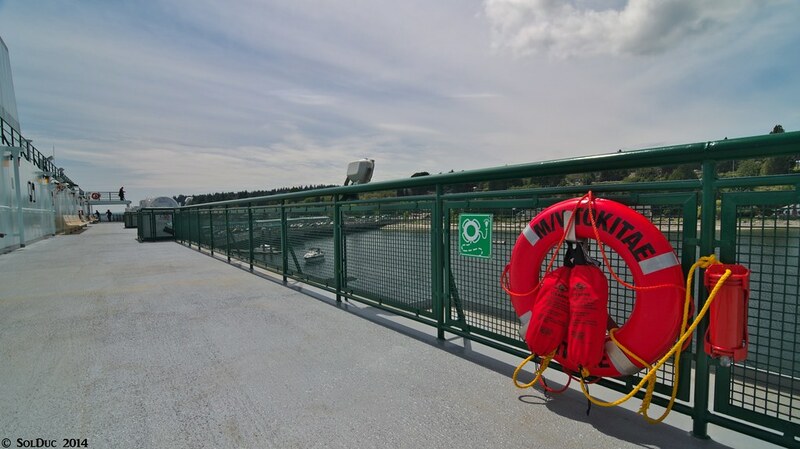 Up here in BC, we noticed the same thing with our recently-new Coastal class ferries. The compartmentalized cabin makes it more tolerable during a full & busy trip. 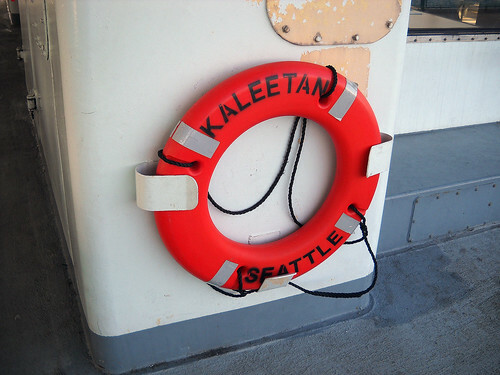 Allright, here are my photos from the Tokitae's open ship this afternoon. Third, let me tell you that just like the Kennicott last year, I will be doing this from bottom to top. Now going up to the main deck, with shots of the cabin. Now moving up to the Sun Deck. 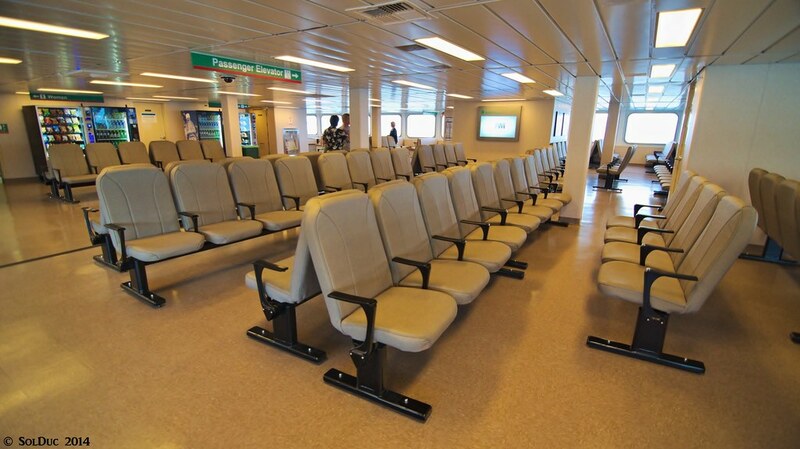 The Seating is similar to the KdT's, except that it has armrests. Good thing? Not sure, since you can't lay there and take a nap in the sun. Now moving up to the very top, the interesting part! The view from the bridge. Pretty similar to a Super, in terms of height. And to finish this post, a bell that Ferryman would be proud of. Nice pics of Tokitae, Solduc! I have gone through mine, but I won't be posting them, since it's nothing new or better than anything that's already been posted today. I may provide a link to my pics if anyone is interested. I will echo some of the comments about Tokitae's interior - lots and lots of brown! 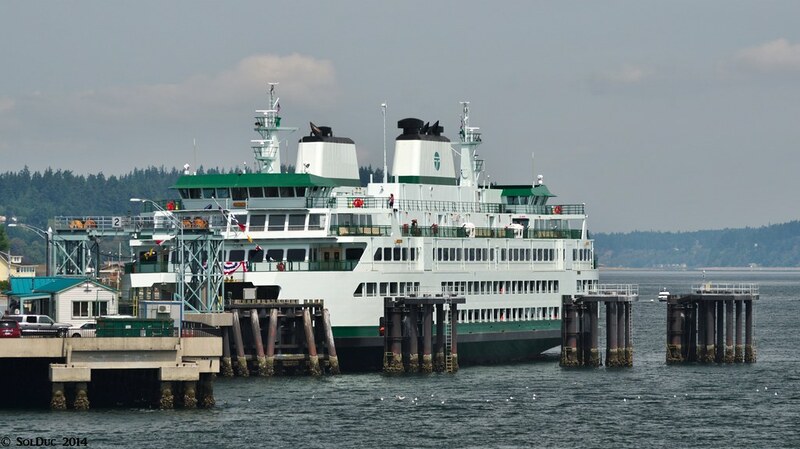 Compared to the cabin refrehses WSF did for Walla Walla and Tacoma, I was expecting more colour for this vessel. It's pretty bland, but the seats are at least reasonably comfortable. 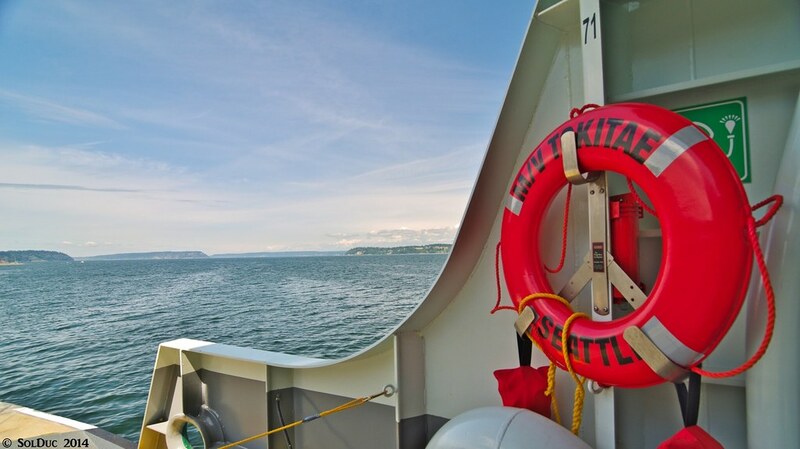 Sunday, June 8, 2014, was a ferry good day for us here on the Salish Sea. 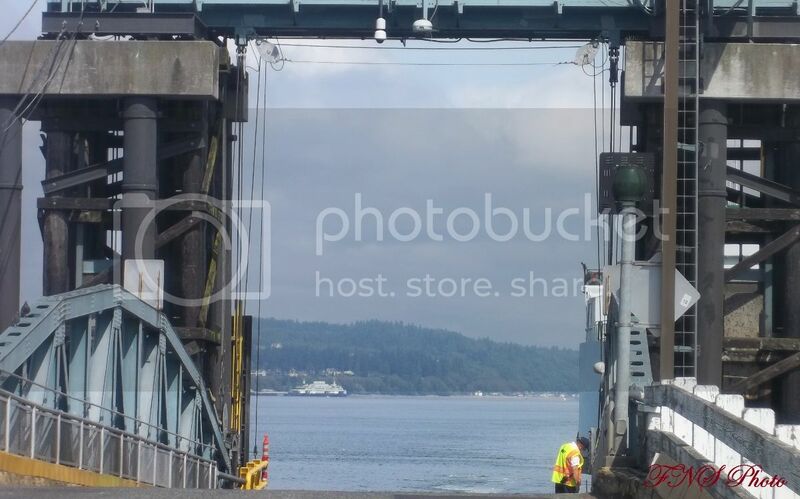 We had an Open Ship to attend at the Columbia Beach (Clinton) ferry dock. Today probably marked the first time since 1981 when three ferries held public souls aboard at the same time in this area we are looking at. 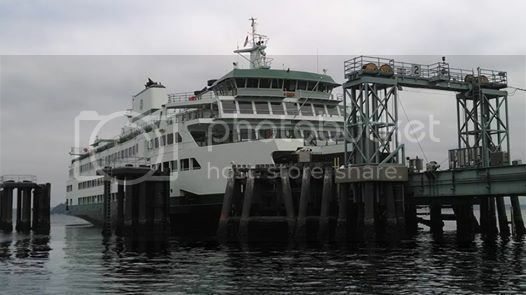 1981 was the last summer to have three ferries on this run with the ILLAHEE, NISQUALLY, and KULSHAN serving. The TOKITAE was not ferrying passengers between these docks this day, though. She was a stationary platform for the public to look at inside and out. This is how we saw the third vessel made fast on the other side during slack periods. 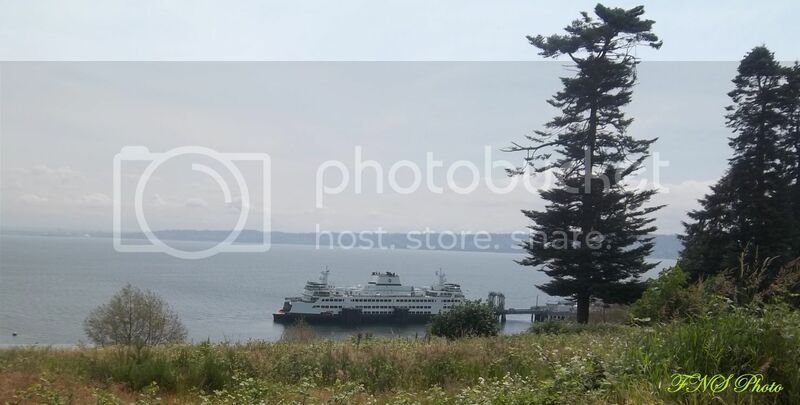 I remember coming down the hill at Mukilteo well and seeing across the other side the VASHON or CHETZEMOKA made fast in the tie up slip way back in the 1970s. A closer look at the TOKITAE. Despite her big size, the land mass exceeds. Framed by the Mukilteo dock. Here we are at Columbia Beach (Clinton). 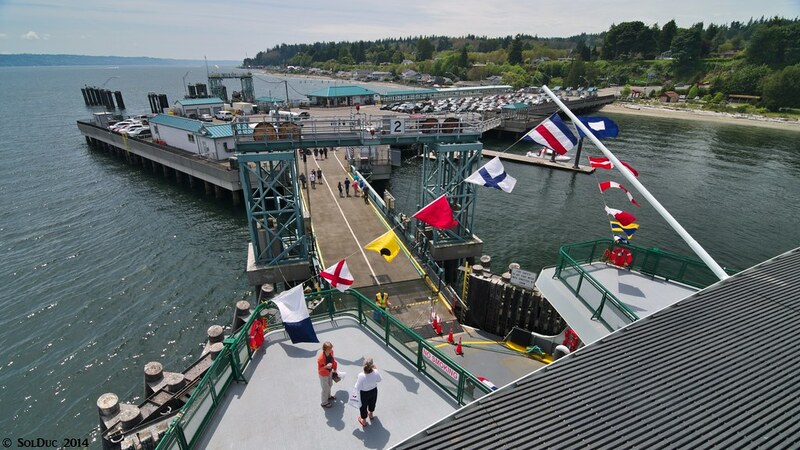 After the Open Ship, I went to Port Townsend and to Winslow. 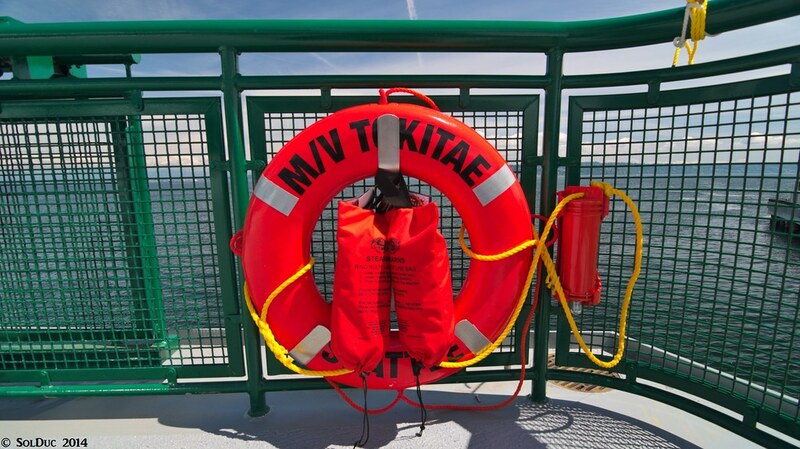 Upon arrival in Seattle, we see the TOKITAE back at her Seattle training base. 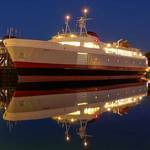 A closer look at the ferry lit up for the night. From the pictures I've seen, boy, the interior seating and color palette looks so dull! 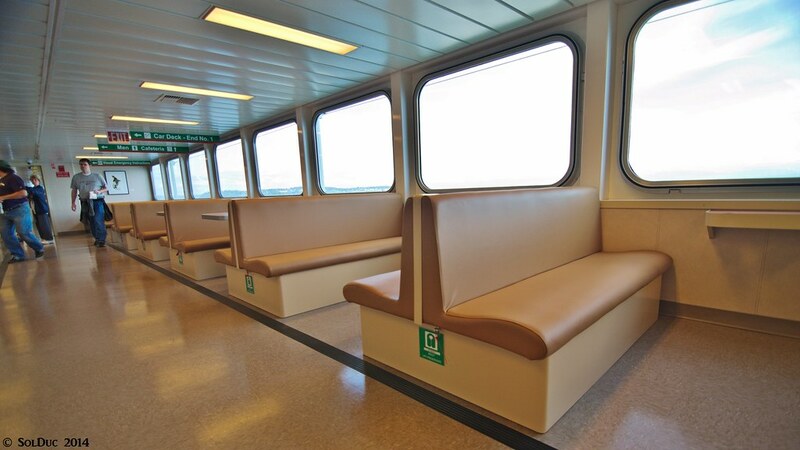 It's just like the original interior on the Supers, and how the Hyak still looks like today. 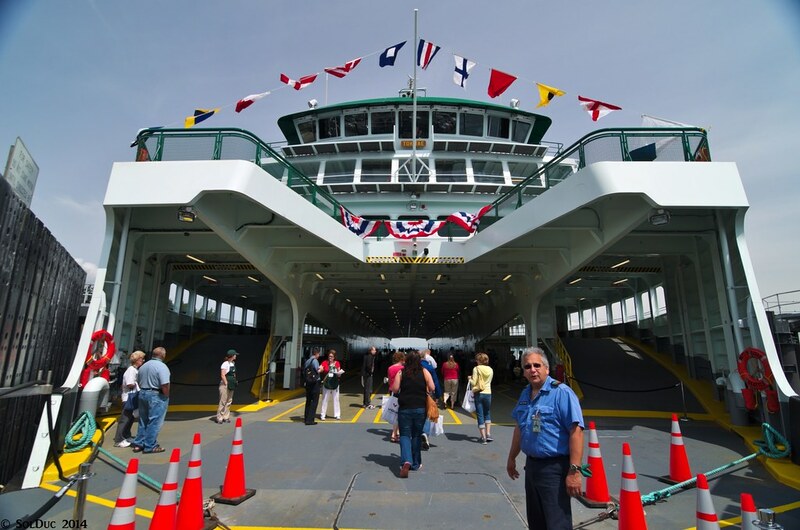 It seemed like they had been moving to some more interesting interior designs in recent years, especially considering what they did with the interiors in the Issaquah, Sealth, Cathlamet, and Walla Walla. And here I was thinking it was some kids. When I was down in the engine room, the bell for the telegraph went off too. 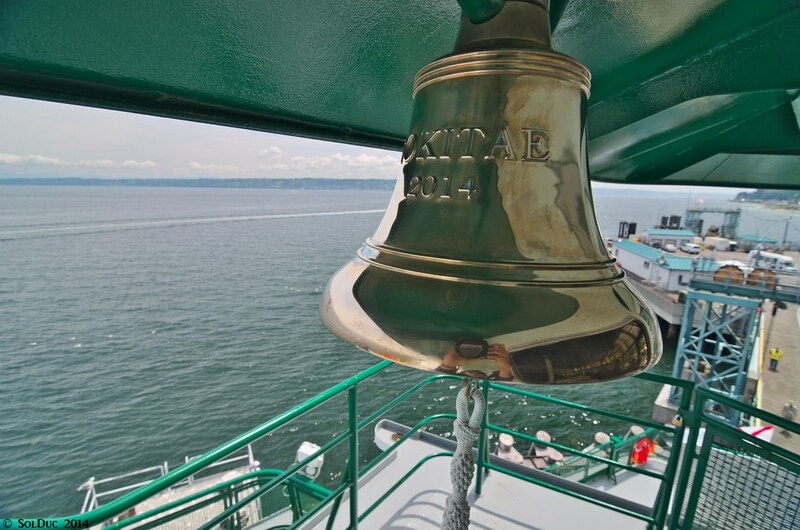 Well, FerryNutSeattle wasn't the only one that blew the horn. I did too, but the right way! I kinda got yelled at by the master of the Cathlamet afterwards because my long blast apparently was too long for her. But hey, here it is. Much better sounding than the Issaquah's.